$15.00 plus tax and fees. Call for Group Pricing. After much demand, that little caterpillar is returning, along with an assortment of favourite puppet characters. 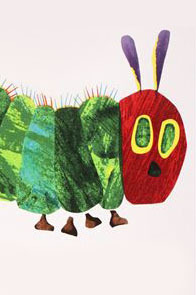 The triple-bill includes the wonderful story of THE VERY HUNGRY CATERPILLAR’s metamorphosis into a beautiful butterfly; the fanciful account of LITTLE CLOUD’s travels through the sky, and the MIXED-UP CHAMELEON’s discovery of his own unique nature. The whimsical tales have enchanted several generations, and Mermaid’s acclaimed stage adaptation teaches as well as entertains. For more information on Manship Theatre's educational programming, visit our education page. For reservations and group rates, contact School Show Coordinator Ronni Bourgeois at 225-389-7266 or SchoolShows@manshiptheatre.org.